This light smoked salmon dip is nothing short of addictive. Bonus – it comes together in 5 minutes! 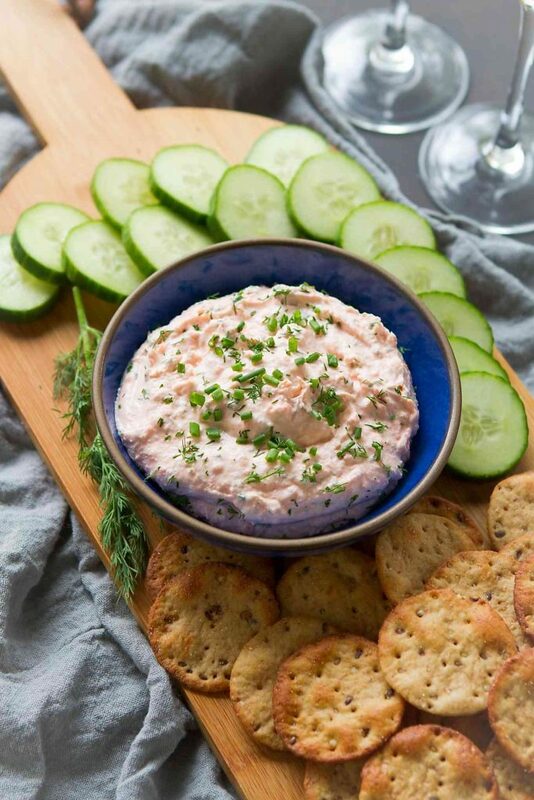 The inspiration for this 5-minute smoked salmon dip comes straight from my mum. When I was growing up, my parents often invited friends over for dinner and I could always be found hanging about the kitchen, hoping for the appearance of this smoky, salty dip. My love for smoked salmon is well known in my family, and that adoration has crossed over to my recipe collection. This light appetizer, these little bites and this breakfast hash are exhibits A, B and C. It only made sense to add a lightened-up version of my mum’s smoked salmon dip to the mix. Coming up with a healthy smoked salmon dip was a breeze. First step, replace the full fat cream cheese with Neufchatel cheese, which has about a third of the fat. Neufchatel can be found right beside the boxes of regular cream cheese in the dairy section. If you come across a recipe for smoked salmon dip, it typically includes sour cream or mayonnaise. Instead, I swapped in plain nonfat Greek yogurt, which provides the perfect amount of tanginess without the added calories and fat. Whiz up the main ingredients in the food processor until smooth, then add the capers, dill and chives. A quick pulse is all that’s needed to mix it all together. Serve up the dip with crackers and cucumber slices. 1. 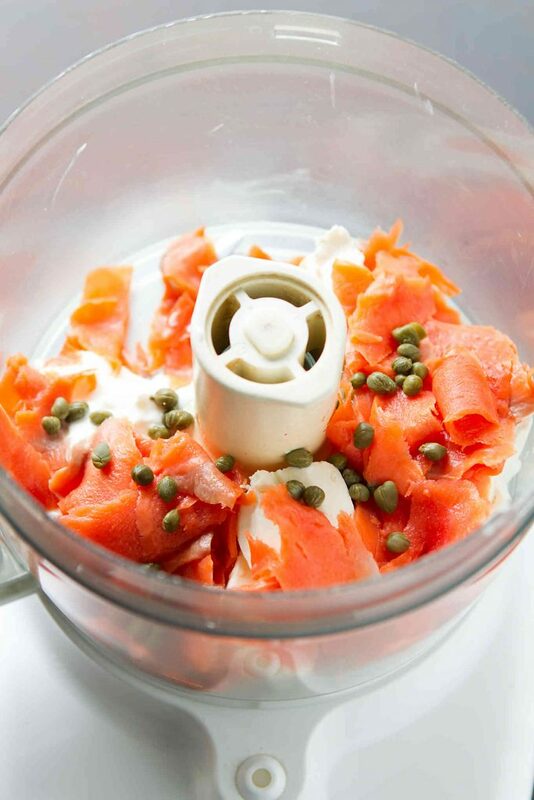 In the bowl of a food processor, combine the smoked salmon, cream cheese and yogurt. Pulse until almost smooth. 1. Add the dill, chives and capers. Pulse 4 to 5 times, to combine. 3. Serve with crackers, pita wedges and raw vegetables. Dip as a starter makes dinning table look more appetizing. Thanks for sharing the recipe. I’ve been looking for the best and delightful way of making salmon dip and this one deserves applaud. 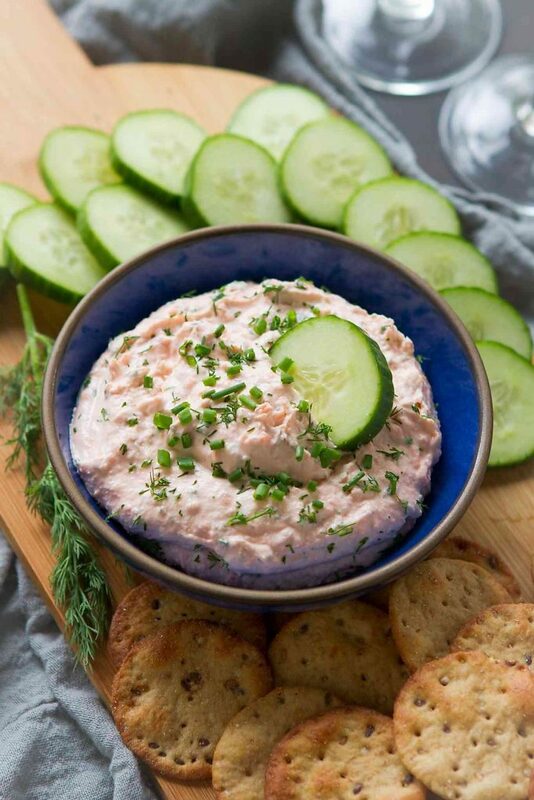 I love smoked salmon and this dip perfectly suits my palate. The process is easy and the ingredients too! Plus, this one is definitely a healthy choice as well! Thank you for bringing out such a great dip!